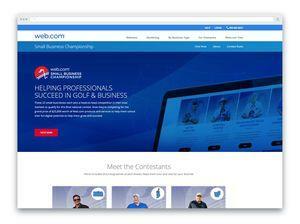 Web.com Opens Voting for ‘Small Business of the Tour’ Grand Prize | Web.com Group, Inc.
JACKSONVILLE, Fla., Oct. 03, 2018 (GLOBE NEWSWIRE) -- Web.com (Nasdaq:WEB), the marketing partner for businesses wanting to connect with more customers and grow, today announced that voting has begun to select the winner of the second annual Web.com Small Business of the Tour Award. Twenty-two local business finalists across the U.S. are vying for $25,000 worth of online marketing services provided by Web.com’s team of experts. Web.com started this small business program in 2017 to recognize and reward business owners who have positively impacted their communities and exemplified hard work to achieve their potential. “The competitive spirit and community pride we saw this year was absolutely inspiring. And now we have 22 exceptional small business finalists competing for the ultimate recognition,” said David Brown, chairman, chief executive officer, and president of Web.com. Indeed, the stakes have been raised, as the finalists will now compete for votes to be named as the Grand Prize Winner. The small business with the most votes will win $25,000 in Web.com customized online marketing solutions. The prize was crafted to create a significant boost to the winner’s business, as the prize amount is approximately 10 times more than the average small business owner spends annually on media and marketing efforts, according to the advisory firm BIA/Kelsey’s Local Commerce Monitor. From now through Nov. 1, people can visit the contest website to cast their vote and learn more about the competing small business finalists. People can vote once per day throughout the duration of the voting period. * After casting their vote, voters can easily share who they selected through their personal social media profiles. “At Web.com, we understand that small business owners depend upon the right team and tools to fulfill their potential. We’re eager to recognize these special businesses and to partner with the winning contestant to strengthen his or her brand and drive more customers,” added Brown. Since 1997 Web.com (Nasdaq:WEB) has been the marketing partner for businesses wanting to connect with more customers and grow. We listen, then apply our expertise to deliver solutions that owners need to market and manage their businesses, from building brands online to reaching more customers or growing relationships with existing customers. For some, this means a fast, reliable, attractive website; for others, it means customized marketing plans that deliver local leads; and for others, it means customer-scheduling or customer-relationship marketing (CRM) tools that help businesses run more efficiently. Owners from big to small can focus on running the companies they know while we handle the marketing they need. To learn how this global company collaborates with customers and employees to achieve their potential, explore www.web.com or follow on Twitter at @webdotcom or on Facebook at www.facebook.com/web.com.